(Bloomberg) -- Tom Enders just couldn’t resist the swipe at the competition. 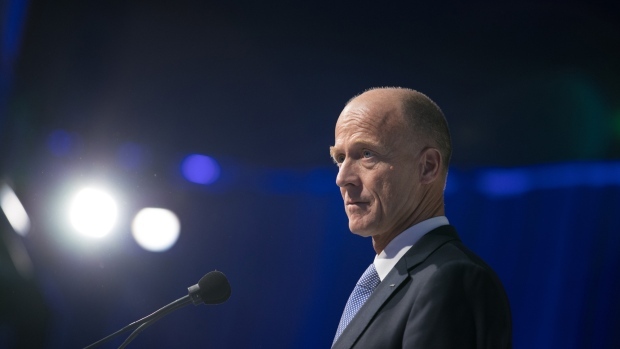 It was June 2011, and the chief executive officer of Airbus SE was on a stage at the Paris air show after the planemaker won in a matter of days an unprecedented 600 orders for its upgraded A320neo airliner, while Boeing Co. stood on the sidelines. After decades of steadily declining aircraft accidents, the question of how two identical new planes could simply fall out of the sky minutes after takeoff has led to intense scrutiny of the 737 Max’s systems. Adding to the chorus in the wake of the crash was President Donald Trump, who lamented the complexities of modern aviation, suggesting that people in the cockpit needed to be more like nuclear physicists than pilots to command a jet packed with automated systems. “The benefits of automation are great, but it requires a different level of discipline and training,’’ said Thomas Anthony, director of the Aviation Safety and Security Program at the University of Southern California. Pilots must make a conscious effort to monitor the plane’s behavior. And reliance on automation means they will take back control only in the worst situations, he said. That man-versus-machine conundrum has been central to civil aviation for years. Automation has without doubt made commercial flying much safer, as planemakers added systems to help pilots set engine thrust, navigate with greater precision and even override human error in the cockpit. The most daring descent in recent memory, Chesley “Sully” Sullenberger’s landing of US Airways Flight 1549 in the Hudson River in early 2009, is Exhibit A of how an interconnected cockpit worked hand-in-hand with an experienced pilot. Automatic pitch trim and rudder coordination assisted manual inputs and kept the Airbus A320 steady on its smooth glide into the icy water. The drama showed that automation can play a crucial support function, provided a pilot is fully trained and the aircraft properly maintained. Airbus traditionally has pushed the envelope on automation and a more modern cockpit layout, with larger screens and steering by joystick rather than a central yoke, turning pilots into something akin to systems operators. Boeing’s philosophy, on the other hand, has been to leave more authority in the hands of pilots, though newer designs also include some computerized limits. Like Airbus planes, the latest aircraft from Seattle -- where Boeing makes most of its jetliners -- are equipped with sophisticated autopilots, fly-by-wire controls or systems to set speed during landings. But the counter-argument is that increasingly complex systems have led computers to take over, and that many pilots may have forgotten how to manually command a jet -- particularly in a moment of crisis. That criticism was leveled at Airbus, for example, after the mid-Atlantic crash of Air France Flight 447 in 2009 that killed all 228 people on board. Analysis of the flight recorders showed the crew was confused by stall warnings and unreliable speed readings, leading to erratic maneuvers that ended in catastrophe. The Max gave Boeing a relatively cheap path back into the narrow-body game that it was at risk of losing to the Airbus neo. At the time, Boeing had to make a quick decision, as it was still burdened financially by the 787 Dreamliner wide-body that was over budget and behind schedule. Half a century after it was launched almost as an afterthought, the 737 program has become the lifeblood of Boeing that helps finance the rest of the corporation -- the biggest U.S. exporter. It’s the one aircraft that Boeing cannot afford to give up. --With assistance from Alan Levin, Benjamin Katz, Margaret Newkirk, Michael Sasso and Mary Schlangenstein.